The Vizsla is a unique breed. Hunting dog, pointer and retriever, this dog has been bred to hunt close by his master. This characteristic is also one that makes this dog really affectionate, the Vizsla is often called the “Velcro Dog”. They are sensitive, affectionate and require a lot of attention; excellent with children, they also need to be a member of the family in full standing. 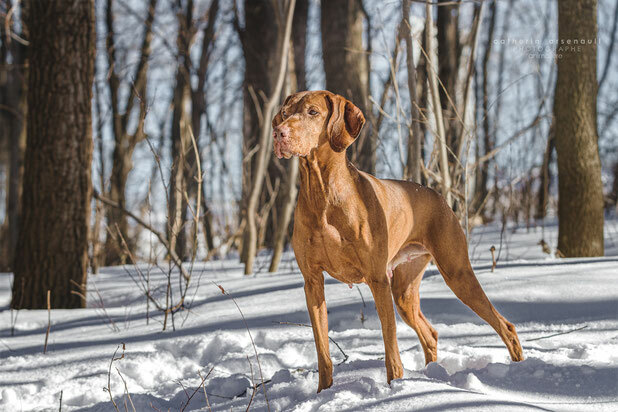 Many Vizsla owners will tell you that this breed is half-dog, half-human. They have a big personality and take their place, preferably beside you on the couch! As mentioned before, they like to receive lots of attention and simply be with their people. Energetic, the Vizsla needs a lot of exercises. Be aware, it’s also a really intelligent dog that needs to be mentally stimulated. Therefore, it’s fundamental to find various activities be it obedience, hunting, agility, Frisbee, swimming etc. There is a lot of choice. This breed also loves the off-leash run. They want to please and so are easy to train, but they need clear boundaries. Without the appropriate exercise and proper guidance, they can become destructive. The look of the Vizsla often make it an interesting breed, but don’t get fooled, it’s not for everybody. 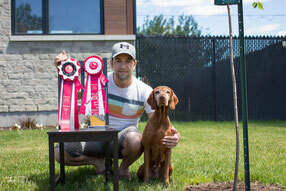 The Vizsla has a short coat which makes it an easy care dog. They don’t have undercoat and therefore are not the most enduring dog in the cold but they still love the snow. They do shed like all other dogs, but in less quantity. They require to be bushed about once a week to remove the loose hairs. This breed does not smell like a dog even when wet, a great advantage. The nail trimming and the ear cleaning still needs to be done on a regular basis.